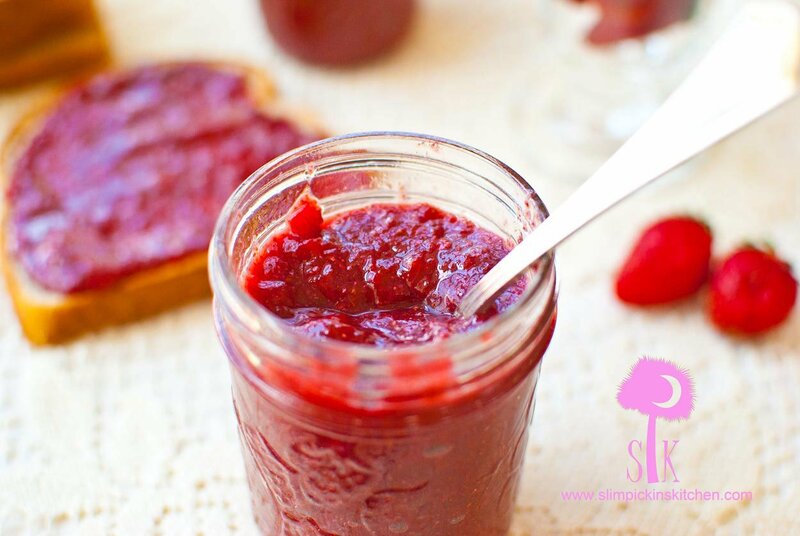 Strawberry jam has always been, well, my jam! 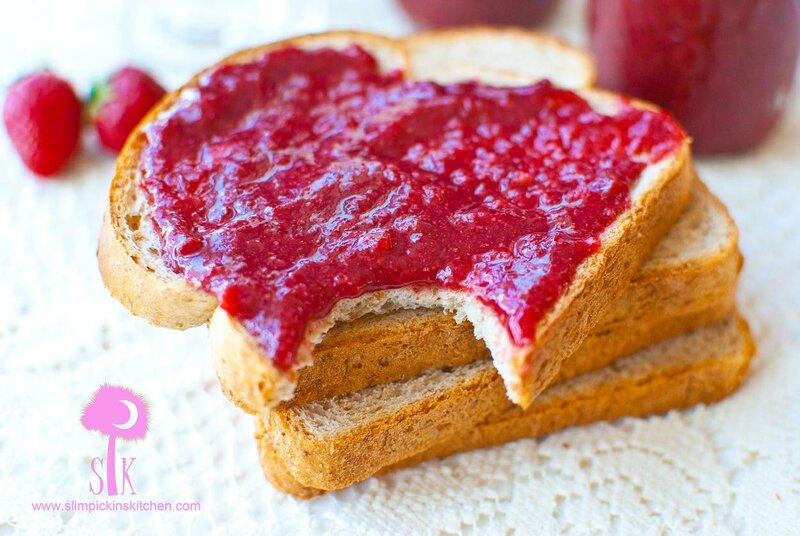 Layer it on toast, drizzle it over a wedge of creamy brie, or slather it on some thick, seedy bread for an out of this world PB & J. 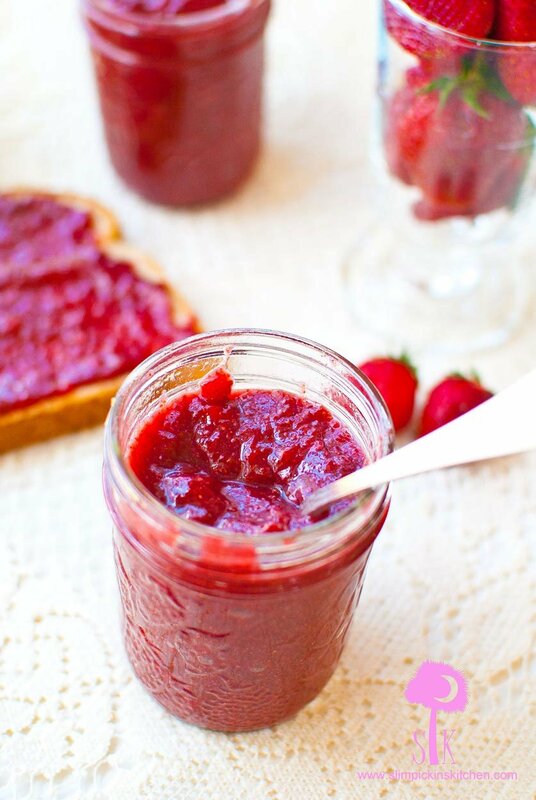 In my opinion, there is nothing better than fresh homemade strawberry jam and, when mixed with a hint of sour rhubarb, it just makes the sweet spread absolutely swoon worthy. When we picked those 37 lbs of strawberries a week or so ago, I knew that I was going to attempt to make strawberry jam from scratch for the first time ever. 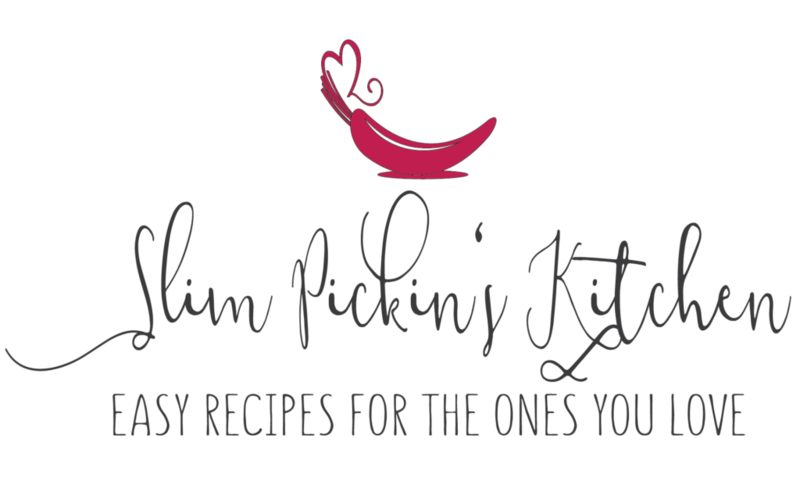 I don’t have the patience for such annoying things as stirring fruit and adding pectin and sanitizing and canning and all of that other nonsense, but I figured if I made the yummy goodness in the crock-pot then I could avoid such mundane and tedious tasks. I’m happy to say that I can now show you how to make strawberry jam in just a few short hours and with as little as five ingredients! I have to say that going to the strawberry fields and hand picking the fruit ourselves really added to the adventure, but if that’s not something you have the time or money to do then please feel free to just pick up a couple of containers of the juicy jewels from your local grocer or farmer’s market. Oh, and if your husband is anything like mine, which is a complete and total strawberry-a-saurus who would rather stick needles in his eyes than go a day or two without eating a strawberry or eighteen, then you may want to make a double batch of this and do some of that crazy canning and sanitizing nonsense I mentioned earlier. Have you ever made jam with chia seeds? Add rhubarb, strawberries, and cinnamon stick to a slow cooker, cover, and cook on low. The strawberry jam will need about 6 hours total to cook. After the first hour, stir, then crack the lid to allow the steam to escape. Leave the lid cracked and continue cooking for another 4 hours. At the start of the 5th hour, stir in the sugar and chia seeds, turn the heat to high, then stir periodically to prevent the spread from scorching. At this point, you can either puree the mixture for a smoother spread or leave it chunky as shown in the pictures in the post. Allow the jam to slightly cool, then spoon into a pint jar. Keep refrigerated for up to a week. I just started canning and jumped in, head first! Bought a pressure canner and put up some chicken, beef, and sausage. Now I’m ready to try some fruits. I wonder how well this jam recipe will can? By the way, what are chia seeds? 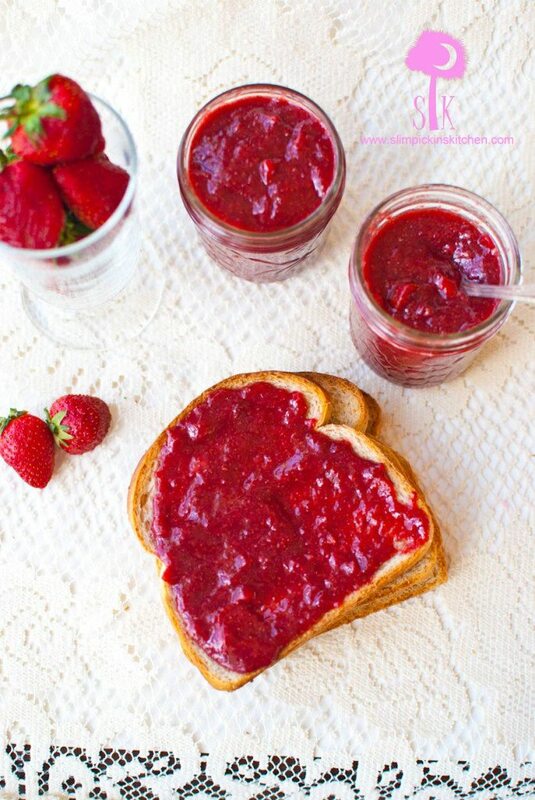 This jam recipe should can very well! You shouldn’t have any problems with it. Chia seeds are a super healthy ingredient that are full of Omega 3’s. Google them! I am trying this recipe today. I am nearing the end of the hour on high but the mixture is still very runny. I couldn’t find the chai seeds and thought I could leave them out. I didn’t think they would harm the thickening process. What do you suggest? Hi, Tana. The Chia seeds are actually pretty imperative in this recipe because that is the agent that causes the mixture to thicken. Without them, the “jam” will be more like a sauce. The mixture will SLIGHTY thicken as it cools; however, without the seeds it isn’t going to be very thick. It will still be delicious, just not thick. Unfortunately, I don’t really have any suggestions other than maybe adding in some dissolved unflavored gelatin or even cornstarch? Clearly, I can’t vouch for the results and it may turn into a mess, but that’s what I would try if it were me! Try scooping out a bit, add in a bit of a cornstarch slurry (cornstarch dissolved in water) and see how that works out. After reading about the seeds, I realize their importance. If I add them now and continue cooking another hour will the spread thicken? Do the Chia seeds make the jam taste different? Do they soften up? 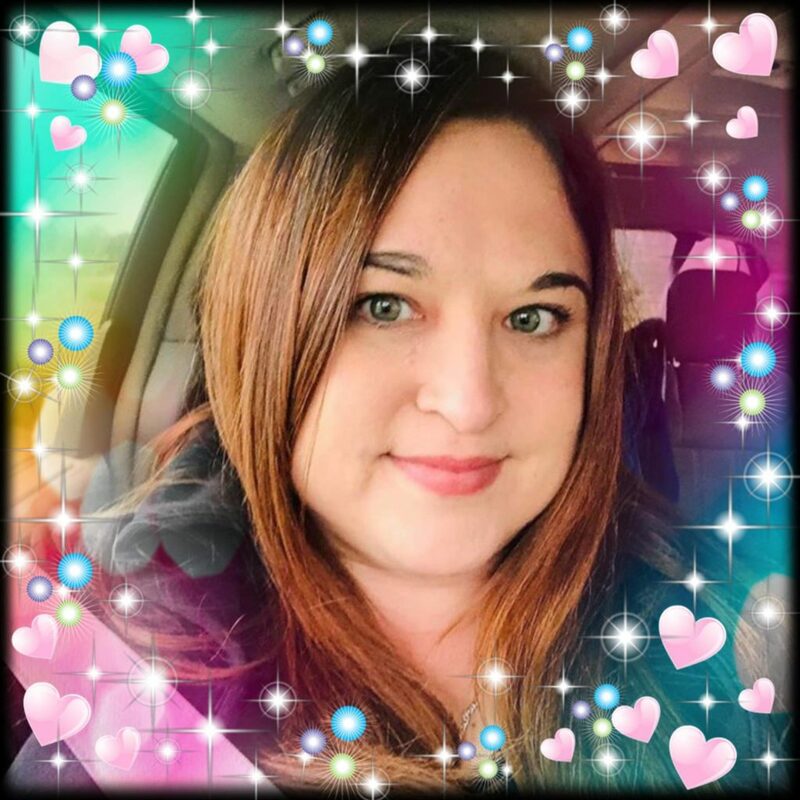 Hi, Cheryl! No, the chia seeds do not make the jam taste different, and they do soften up. They are, in fact, an incredibly important ingredient bc they thicken up the jam. Without them, the jam will be more like a sauce. You mention storing in refrigerator, could you also freeze? I haven’t tried it, but I honestly don’t see why not! I’ve made this recipe twice now and doubled it both times. Hubby called it exceptional and the best jam he’s ever eaten. He puts it on everything now and the kids love it too. I put it in individual small glass jars and keep it for two weeks and it’s fine. It goes well as a cheesecake topping too or even on crepes, waffles, muffins and pancakes. We’ve decided to make it part of our topping selection for cheesecakes in our restaurant! So easy to make and this summers surplus of strawberries makes it inexpensive too! Thanks for the recipe! WOOOOOOOOW!!! That’s amazing!!!! Can you send me a copy of your menu when it’s on there so I can see one of my creations in print?!? How cool! Thanks so much for the feedback!! !